The story Kevin Avery tells is of someone who believed passionately in the art that moved him, whether it was Zevon, the New York Dolls—who he convinced Mercury Records to sign when he was their A&R rep—or Bob Dylan. He championed many of the New York singer/songwriters who collectively would come to be known as “the New Dylans,” and he treated musicians as par with the novelists and filmmakers he referenced when talking about music. Few of the artists profiled in the selected works do much for me—late ‘70s Rod Stewart, Jackson Browne, Zevon—but Nelson writes about each with such care and insight that I went back to listen to all of them again. His grimly funny account of his days at Mercury is a look into another industry that has changed radically. 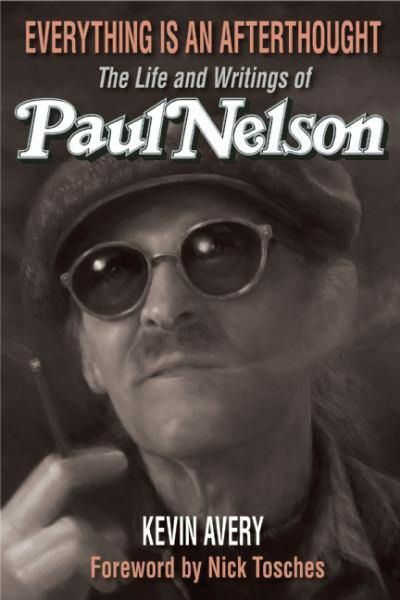 Nelson’s post-Rolling Stone story is a sad decline as he found himself unable to finish projects, and ended up working in a video store for much of his later life. He successfully pitched books on Neil Young and writer Ross MacDonald, but never delivered either, despite having done countless interviews with Kenneth Millar (MacDonald’s real name). He interviewed Clint Eastwood on and off for four years for a Rolling Stone cover story he never finished. Kevin Avery has edited those interviews with Eastwood into Conversations with Clint, a look at Eastwood’s career from his television days on Rawhide to The Gauntlet, the period when Eastwood became a star. Nelson talks with him at length about the spaghetti westerns, Sergio Leone and Dirty Harry, but he spends significant time talking about some of Eastwood’s less respected films such as Every Which Way but Loose and Bronco Billy. Because Nelson was a film buff, the conversations tilt toward the role of directors, particularly Don Siegel, who worked with Eastwood on a number of films including Dirty Harry. Eastwood consistently provides subtle insight into the life of an actor and his decision-making process, speaking frankly about what he saw in roles or projects, and what he thought of the results. The books combined don’t make a claim for Nelson as the woefully overlooked writer of his time, but they put him back in a conversation he’s been AWOL from for too long.